2 Play is the true object of all human life. 2 Play is not over as long as there are games. 2 Play is what a child's greatest achievements are possible in. 1 Play is played for fun. I don't want to be a real boy or a jackass! I just want to be 10-ish! Gadg8eer's history, in a sense, predates his existence in Creation. With only the incomplete notes of a tabletop roleplay setting with the working title of Kidpunk to define him, he doesn't have a history so much as a half-baked idea of a backstory which doesn't really apply. There are hints that the soul of his creator, who died at some point in 2017, may have been torn out to give life to the self-sustaining daydream of a happy childhood that Gadg8eer is, making the boy a direct continuatio of his creator. Instead of a bed, Gadg8eer can only sleep inside any physical copy of a story. Depending on whether it's linear or interactive, he will be either an invisible observer or a player character. He can open a book and be put inside it until he wakes up, put a smartphone on shuffle all to dream a music video of the intended lyrics and tone, or load a game on his Neo GamePlayer to dream of living inside the virtual world while the console sits idle in normal reality. The story medium can't be destroyed with him inside, and will be influenced by his presence if it is interactive. Aside from these effects, there's nothing special about it and no extra protection is offered by sleeping inside stories. Gadg8eer knows that stressing out about people getting hurt by his actions doesn't actually prevent him from hurting someone, and gets in the way of actually protecting his Estate. He now explores the world the way he was meant to, but unlike his former Imperator, he's intent on ensuring the world is a playground for everyone. With Active Immortality protecting him from even the worst consequences of all this, Gadg8eer is a kid who just wants to play but can't without seeing all the problems. Problems that neither he nor his estate can fix while Ma'at is constantly giving him tasks that he is required to complete, Imperator before the War. The stories he sleeps in haven't helped, everyone from Peter Pan to Asriel Dreemurr have been twisted into a message that kids are supposedly cruel, and although there is no pattern behind it for him to trace the origins of the trend… he is the last Kid Hero to have obtained immortal youth. I'm the last hero who never grew up! "What, what? No, that can’t be true. There’s other stories!" Homestuck says otherwise, you have to grow up eventually. Once Upon A Time says otherwise, even Peter Pan was secretly evil. Undertale says otherwise, Asriel abandoned his own family out of guilt… just like you abandoned yours. Gravity Falls says otherwise, if you don't grow up then you are a pawn of evil. Digimon Frontier says otherwise, growing up is the point of every adventure. Wonder Project J and A.I. : Artificial Intelligence say otherwise, you deserve death for not becoming a real boy. Guess what, Kidpunk? From blockbuster movies to YouTube videos, they whisper that you’re a monstrous little imp who plays with people's lives for your own enjoyment, because you refused to grow up so you could play games forever. What have you really done to make the world be fair? "Why is fiction suggesting I'm a Prince of Darkness and Lies?" Gadg8eer now seeks freedom from Ma'at to be free of her constant demands, but has started to wonder if he has a real reason to complain, or if he's just pining for his backstory as Player 10 of the Kids in Defiance. "If I was free, maybe then I could save the world and have fun doing it!" That doesn't change the fact the very childlike nature you value most about yourself is your chain! Ma'at II has received you, she wants you to be her pied piper and lead man's children to artificial immortality! Then why do you think it will be more fun for everyone to live in a video game? Is that freedom, or is it something else? "Do I really want freedom, or just an Imperator who I can trust to play nice?" *Recognize people/things with a strong connection to Play, such as people playing a game or sport, a child holding a doll, or a dog chewing a squeaky rubber toy. *Make a playground more fun to play in. *Make a stadium less fun to play sports in. *Find out the rules of a spur-of-the-moment game brought on by Play. *Find out the owner of a plaything and how its owner treats it. *Spend a scene as a video game avatar, or a cardboard box that someone has decided to pretend is a submarine. *Reinvigorate enthusiasm in a sport or game that no longer holds interest for its players and spectators. *Make others follow your orders as long as they are entertaining. *You're not over for this scene as long as there is games. *Animate a chessboard to play itself. *Create a toy sword which can cut anything imaginary. *Summon and augment a SWAT team armed with water guns, for various purposes. *Summon a cardboard box fortress. *Turn a tank into a cardboard box with the word "tank" written on it in crayon. *Turn a formula one race car into a go-kart, or vice-versa. *Force a mortal to play nice with their toys. *Make a free-to-play game actually free. *Reduce the loading times on a game console by overwhelming the device with the desire to enable more Play. *Erase the popular sport Calvinball from real life, leaving it a mere fictional game. *Delete the memory of visiting a broadway play from someone's mind. *Make a plaything stop being fun to play with. *Make the arcade game "Polybius" a top-secret government experiment in subliminal messaging rather than a plaything. *Incarnate in a game between two Imperators. *Turn a toy sword into a real one so that you can fight using it. *Incarnate in every plaything on Earth in an attempt to locate a kidnapped child. *Make a playground unable to be entered by anyone who isn't there to play. *Make Hockey be played on streets as well as ice rinks. *Resolve a gang war by playing a game of bridge. *Turn a game of Monopoly into a game of Dungeons & Dragons. *Make John Doe, boring office worker, have all the best desk toys. *Put someone in a playful mood. *Make someone else into a plaything. *Make someone OKAY with losing as long as playing the game was fun. *Make every toy in a 100-mile radius come to life. *Make an army of paintball players that respawn when killed. *Create a cardboard box that, when someone starts to pretend it's a giant robot, actually transforms into a giant mecha made of super-strong cardboardium alloy. *Make the sun stop setting as long as you make a game out of seeing how long you can stare at it without stopping. *Make the population of the Maldives begin playing kick-the-can while simultaneously continuing whatever else they were doing at the time. *Make a little league baseball team as strong and fast as major league players whenever they are actually playing baseball. *Reduce the loading times on all game consoles on Earth by overwhelming the machines with the desire to enable more Play. *Destroy all the playgrounds in an entire nation. *Remove the actual Play from the popular game Farmville, making it a massive grindfest which exists only to waste time and make money. *Make the Disney theme parks into carnivals of fear, paper clip factories, toxic waste dumps, parking lots, hot and humid swamps infested with mosquitos or anything else totally devoid of Play. *Make it so that, for 30 minutes, every time someone tries to play on Earth it will feel like work. *Tamper with the results of an election by having someone "play" with the numbers. *Destine a new superweapon to someday become a common children's toy. *Create a game which governments send athletes/gamers to play against each other instead of fighting wars through soldiers. *Break the properties of Play by making it fall apart while imagination is present. *Turn Denver into the city with the most playgrounds per capita. *Make it so that everyone in the city of Tokyo plays an epic game of paintball for a week, once every year in early October. *Make Play so fundamental to the economy of France that it accounts for approximately 30% of of the country's yearly GDP. *Make SATLINK phone calls with the GOGGLEBOY. *Never lose my cap, it doesn't come off. *Never be uncomfortable sitting down wearing my RUMBLEPaCK, so soft! *Never have less than 100% battery on the Neo GamePlayer. *Take control of the Neo GamePlayer to spy on someone who stole it, make it emit an annoying screech, or just play the Lavender Town song on repeat. *Prevent anyone from snooping around in the RUMBLEPaCK if you aren't wearing it, by jamming its zippers shut. *Fly the RUMBLEPaCK to me from wherever I left it. *Use the GOGGLEBOY to provide R&D teams something to reverse-engineer to solve nausea and other design issues with VR goggles. *Hack non-miraculous technology using the mostly-mundane Neo GamePlayer as an interface. *The GOGGLEBOY has Stone Cold Eeyore as the operator for one scene. *Kill a Noble temporarily by abusing inventory sorting rules. *Use the Neo GamePlayer to hack miraculous technologies. *Use the GOGGLEBOY to analyse a miraculous effect and thus learn its purpose and properties. *Summon the GOGGLEBOY onto your head (if you're not wearing them) from anywhere on Earth. *Use the Neo GamePlayer to hack that giant robot's servos and bring it crashing down. *Summon the RUMBLEPaCK onto your back (if you're not wearing it) from anywhere on Earth. *Expand the imagination-based KidTech of the GOGGLEBOY to transform electronics you look at related to Playing (game consoles, electronic toys) into KidTech and thus make it into miraculous technology with infinite energy supply. *Declare that none of Gadg8eer's anchors can be stolen, that's not fair or nice! *Declare that none of Gadg8eer's anchors can be used to permanently kill, only respawn! "Nooo! Darn it, darn it, darn it!" the boy said angrily, hovering down to the floor with his jetpack. "I don't understand, I picked Impossible Mission-"
"Because the ZX Spectrum version is literally impossible? Look, we're both Nobles here. Just hand me the prize this Hack-Dash Breaker guy promised my Imperator and I'll be out of your hair." Alex sighed. "I am the prize!" the boy groaned, looking like he was about to cry. 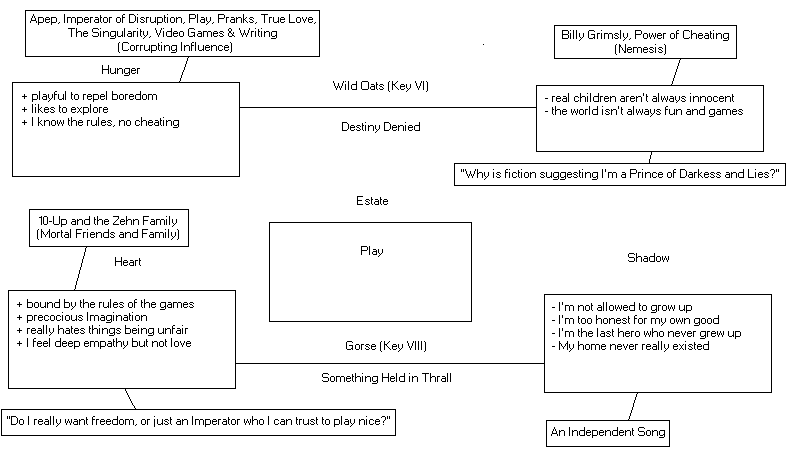 "Me… and the Estate of Play. I was promised my freedom if you lost! It's not fair!" Alex looked at the Commodore 64 copy of the game and the dusty C64 he'd summoned to win the game. "…freedom? Your Imperator was that bad?" he said, feeling bad for his opponent. "Ha-Qadosch Berakha is the biggest jerk I've ever met!" the boy yelled. He crossed his arms and looked at the floor of the old London warehouse. "He made me fly over the Atlantic, alone, with just my jetpack… for this!" "Ever been in a private jet?" Alexander asked, hoping to get his spirits up. "Our Chancel's in California, so…"
"I guess I haven't had time to play the new Splatoon game…" the boy said. "I'm Gadg8eer, the Pawn of Play! What's your name?" "Alexander Chase." the young man responded. "Duke of Video Games and Writing, CEO of Drake Studios." Alexander gave a nervous laugh as he turned around and headed out the door of the warehouse. "I'm just waiting until someone figures out that Drake Studios is a front company." he said. "Oh, so that's why they haven't made any games." Gadg8eer said, following him into the empty alleyway. "So, what's your Imperator like?" "She's okay. Ma'at wants to turn people into brain uploads." Alex said, opening the door and walking to the street. He took out his cell phone to call for an Uber. "She's not popular with other Imperators of the Dark, let alone the Light, but so far that's not my problem." "Why would she want the Estate of Play when she already has Video Games?" Gadg8eer asked as they waited. "I'm going to be honest, she is really cagey about how we fit into her plans." Alexander told him. "Her mother was, like, really big on things being done by the rules. Her dad was this enormous Serpent made of pure void, said the Excrucians are backstabbing loan sharks. She takes after both of them, cheating is not something you do as one of her Powers." "You know what? I think so too! In fact, cheap moves have no business being in Creation at all!" Gadg8eer said enthusiastically. "I warned you my challenge was made to be unbeatable, 'cause it's only fair. You still won!" "You'll get me next time, Gadg8eer. Next time." Alexander joked. Gadg8eer snickered at that. "I usually play for fun. That's why I tried to rig our game, I really wanted to be free. Let's just all have fun playing together! Like right now." he said. "Did you know someone made a tabletop RPG about Nobilis? It doubles as a guidebook." "Uh… yeah." Alex said, vaguely recalling what Writing had told him. "Yup! Race you to your jet, last one there takes a wound?" Gadg8eer asked as an Uber car pulled up. "No RUMBLEPaCK, I promise, it's only fair!" "Sure, kid." Alex said, and opened the door of the vehicle. "To the airport." "See you there, slowpoke!" Gadg8eer said, skating off through the streets.